I can’t remember if I mentioned it here, but my computer kerplunked in November last year, so I have gotten a Mac. My first one ever. It’s skinny, silver, and super pretty. And as thrilled as I am with my new little piece of technology, I’m still figuring out how to use it. As a pledged PC girl… Mac and I are still becoming friends. The point is, I did back up my computer, but I haven’t been able to access my back-up drive because it’s formatted only for PCs and I only have a Mac. So I’ve lost a million recipes I’ve written (during class) and all those pictures I haven’t shown you yet. I mean… I posted the embarrassing ones of my friends on facebook, but I just didn’t get around to sharing them with you in conjunction with my recipes. But maybe that’s an amazing thing… All new things for this year. I like new! Speaking of new, I recently purchased a handheld mandolin so I could feed my obsession with shredded red cabbage salad. I made it first using my mother’s amazingly thin and sharp chef’s knife… but I’m terrified of sharpening my own knife (come on… all that shing and shang while to fling your blade up and down the sharpener… just seems like an accident waiting to happen) so chopping all that cabbage was a snore at my apartment. So I bought that little mandolin. I love it. LOVE it. I think it loves me back, though it first nipped the tips of my fingers off… but now we are friends. The best part of this salad is how pretty it becomes after wilting a bit. The beautiful purple melts a little and turns the white sections of cabbage into bright pink slices. Thinly slice the cabbage. 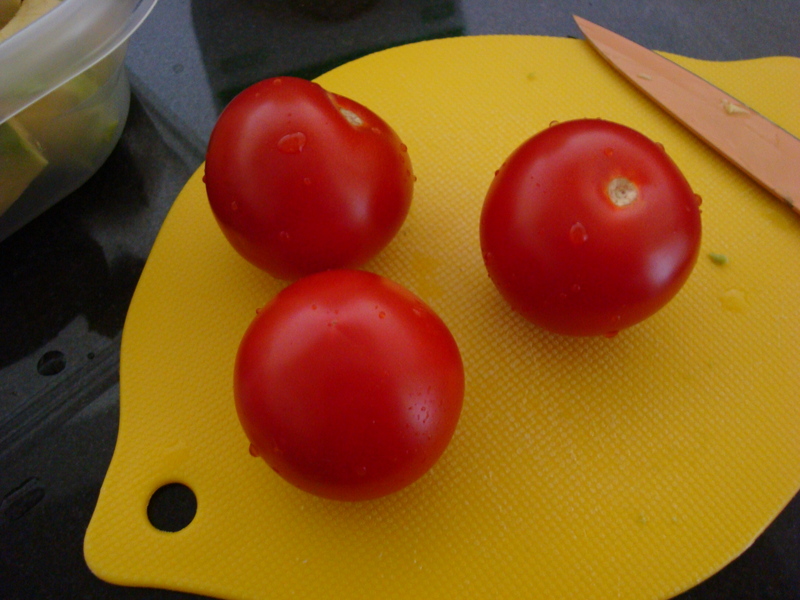 If you have a food processor, you can use the slice function. But if you’re like me and have a mini food processor, go ahead and use a knife. OR that zippy new mandolin. In a small jar, shake together juice, olive oil, and mustard until creamy. 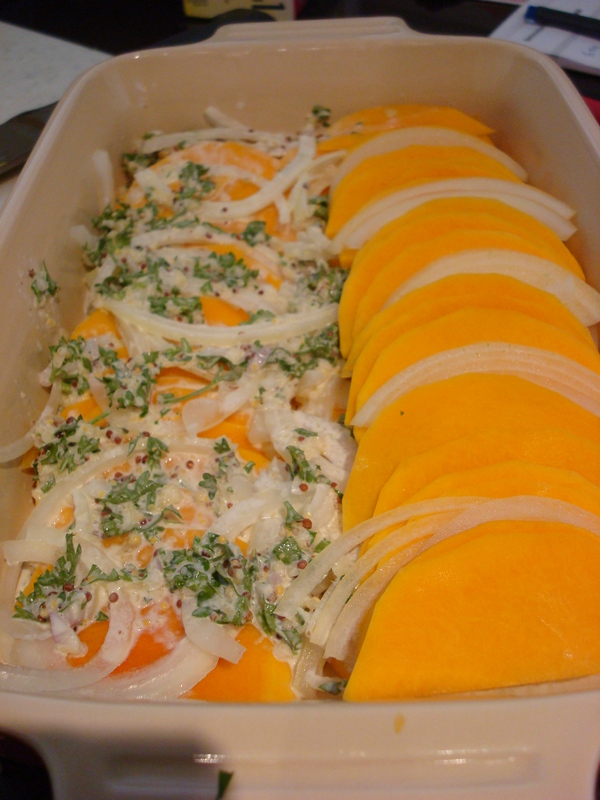 Salad will keep in a well sealed container and refrigerated for about 4 or 5 days. And, since I didn’t take pictures of my pink salad (I wolfed it down right out of the bowl), here are some pictures for the last couple weeks. 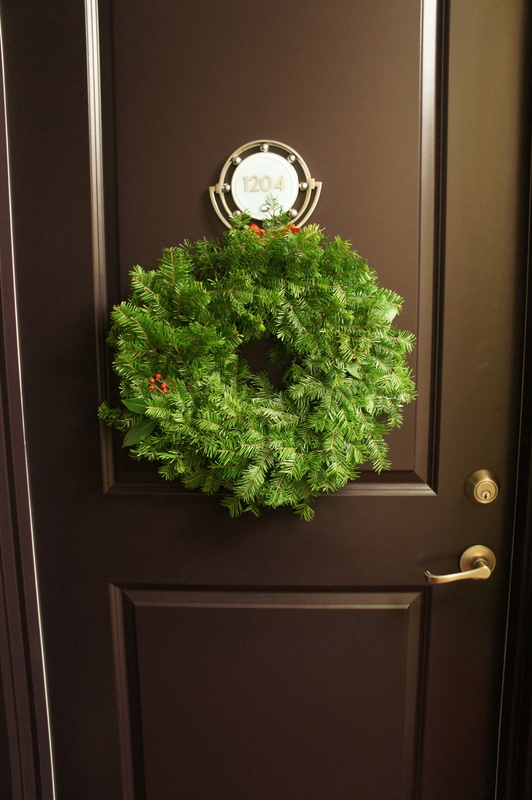 My Christmas wreath that the grumpy old man at the Farmer’s Market sold to me…. that did not smell Christmassy at all! 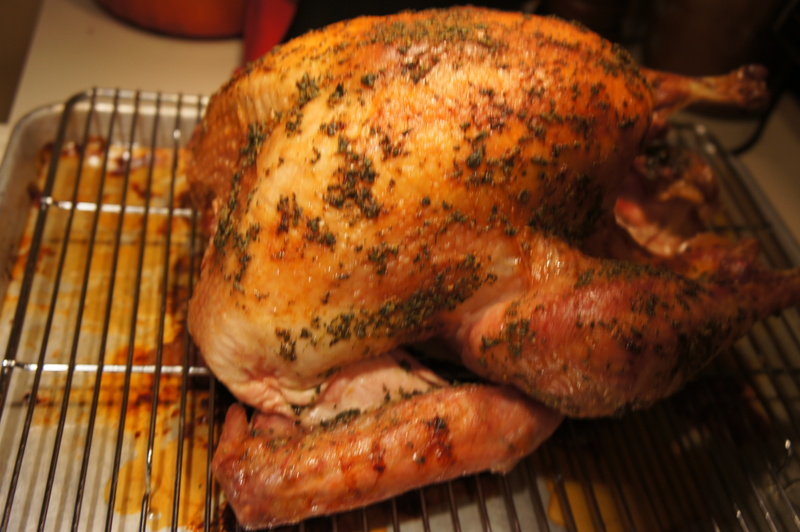 Thanksgiving Turkey, slathered with thyme, lemon zest, and butter. 🙂 Pretty! The first time I read the word “endive” was out of a fancy cookbook that my mother had bought me as a gift. I was 13, maybe 14. It was Thanksgiving, and I wanted to make all of those fancy dishes. I wanted an elegant dinner filled with bubbly champagne and crystal and fancy food. It took a few trips before I found those little endives, and I proudly assembled my fancy salad. Then… I tasted a leaf and declared it “sour” and “gross” before proceeding to bake the stinkiest gruyere potato gratin (which I also deemed “gross”). My 14 year old self felt that the fancy food was a flop, but it’s been a decade since I cooked my first Thanksgiving, and I think my palate has matured with me too. 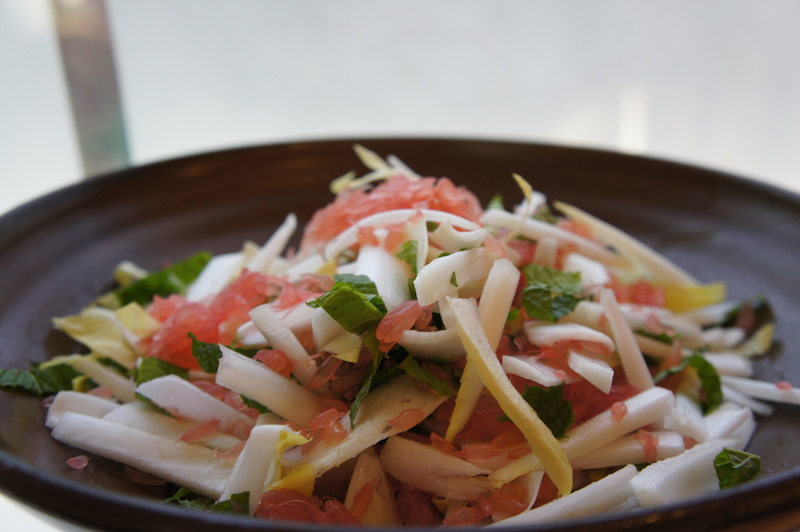 After thinly slicing the endive and mint, toss gently together with the grapefruit. I chose to peel the fruit out of the membrane and crumble the slices so the grapefruit was distributed. Alternatively, for the presentation conscious, you could supreme the grapefruit and place the slices in an endive leaf with mint garnish. Keep chilled until ready to serve. Toss gently with dressing just before serving. In a small bowl, crush the pomegranate seeds until the juice is released. Add the mustard and oil, and shake until the dressing is well combined. Add more mustard if you like. I’ve been thinking a lot about the things that I love most, the things that never fail to delight, amuse and enchant me. The things that always put a smile on my face… what are they? As a notoriously picky eater as a child, I was completely disinterested in food. I never understood the concept of “hungry” or “crave” because I simply was not interested in eating anything. But, as I got older and out-grew my finickiness, I found that summer corn on the cob always tastes good. My mother’s Korean pancakes are always good. I always love peeling and eating pomegranate. And, every time I taste fresh cilantro, I love it. Food, unlike anything else, never fails to enchant me. I never tire of the new flavors and the smell of produce. Food isn’t something that fades. The only two things that I will change my schedule for are good meals and running… everything else can wait. My sister once told me that as a baby my mother would put me in my baby chair and hand me half an avocado. Apparently, I would take handfuls of the avocado and stuff them into my chubby baby cheeks. I’d be covered in creamy green avocado, but I would relish the creamy avocado. 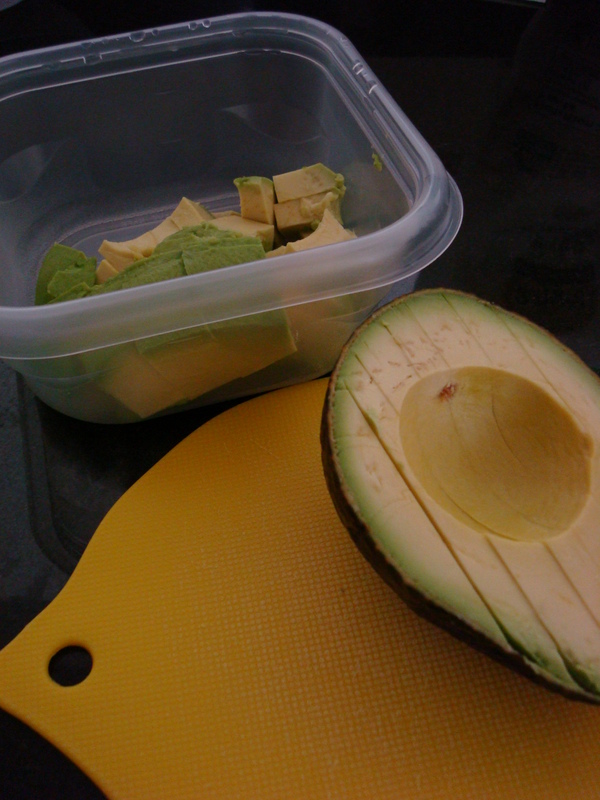 I don’t remember smearing myself with avocado, but I do still love avocado. 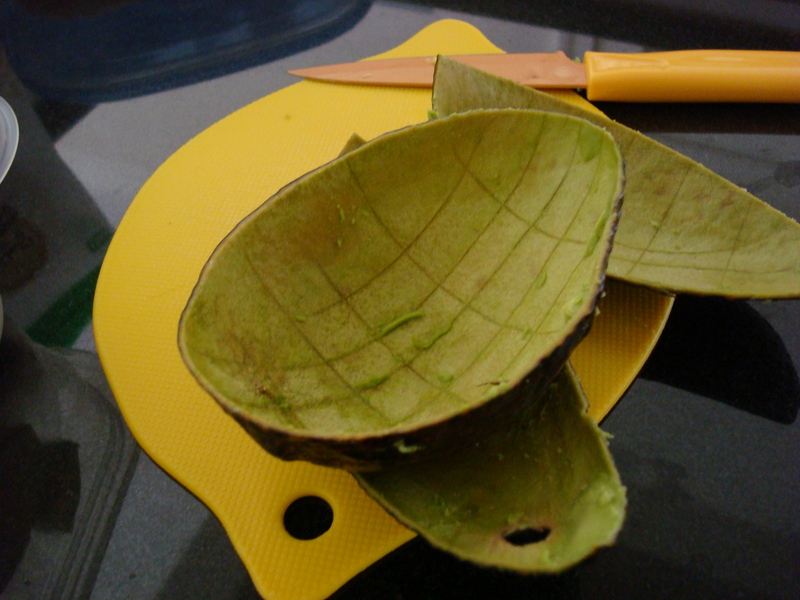 It’s one of those things that never fades, even when I get those disappointing avocados that are brown inside but look just delicious outside!!! Since it is summer, and I am training for a marathon (trying to keep my spirits high!) I am eating healthier. 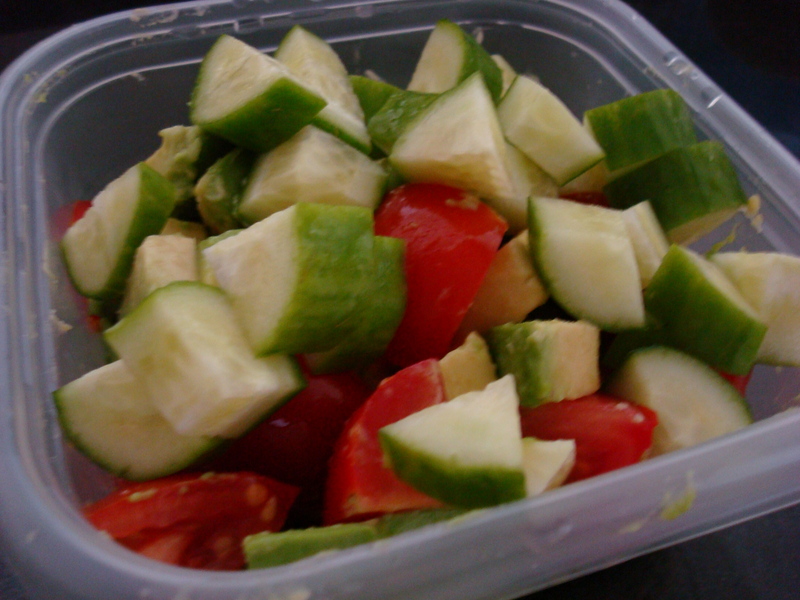 I was pressed for time this morning, but I didn’t want to buy another (ANOTHER) sandwich for lunch – I quickly sliced some avocado and tossed it with tomatoes and cucumbers. A dash of balsamic vinegar and I was running out the door for work. It’s not complicated, and you could add some peppers or chicken to make this more hearty. I often use avocado instead of mayo in chicken salad, and the result is delicious! 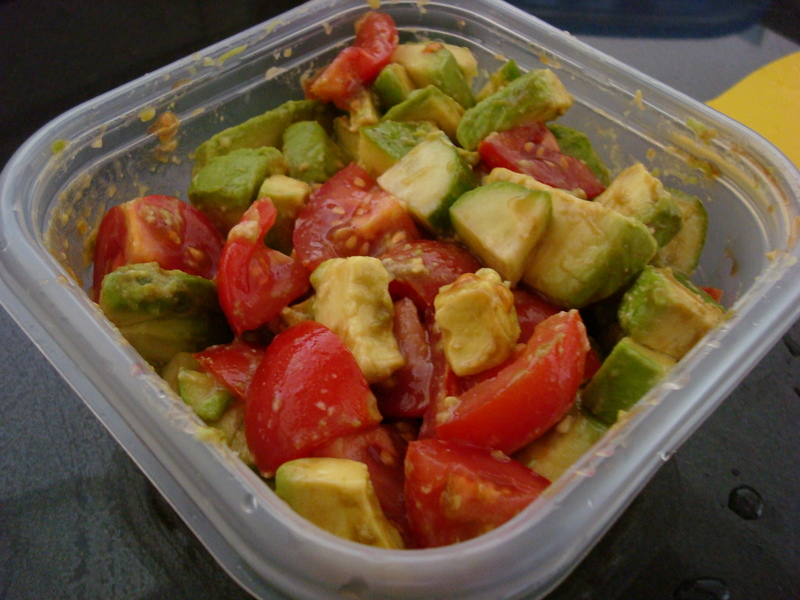 The end product isn’t attractive, but the flavor of the creamy avocado, tart tomatoes, and cool cucumber is phenomenal on a hot summer day! In law school, I think a lot about guilt. We learn and analyze guilt on so many different levels, and think about proving guilt, disproving guilt, and the nature of guilt. Law school has changed the way I think of people, maybe it’s the cynic in me, but I see things in terms of lawsuits, guilt, and how solid my arguments to nail you to the proverbial wall. I judge things based on the gravity of the information I have in my possession… and I research to further analyze whether my judgment is sound. I judge. I judge a lot. The other day, someone asked me, “What are your guilty pleasures?” And I thought… how could something that is pleasurable be guilty? Is it wrong? Are you doing something morally questionable? Why does something that make you happy a guilty thing? Because in my mind – pleasure is good. Feeling good is good. So… what is guilty about it? A lot of people talk about food like that… chocolate is their guilty pleasure… or cupcakes. Or ribs. But to me? Food is never guilty or bad or regrettable. I believe in eating all of the wonderful things in the world and enjoying every single bite… and then if you are worried about the calories? You go run it off… I don’t believe in low calorie. I don’t believe in fat-free. I don’t believe in sugar free. I don’t believe in skipping meals. I don’t believe in dieting to lose weight. I believe in loading up on all of the good things in life. Food, exercise, and laughs. Anyway, a few years back, my sister and I saw some stellar reviews for an arepas bar in NYC. I was working in the Financial District at the time, so my sister collected by father and me from work and we went to the arepas bar. It was delicious. Granted, my dignified father, sister, and I were squished in a little hole in the wall restaurant table nailed against the wall… but the food was delicious. And I was instantly infatuated with the idea of making my own arepas. After doing my research, I bought a bag of masarepa flour and fixings. My family and I ate arepas for months afterward… it was one of those treats we would gather around the table to eat. It was fun. We’d hollow out the pillows of arepas and load them up with cheese, beans, and meat. It was messy, and inevitably the munchkin would stick her head through our arms and try to lick the table. It was so much fun, and so delicious. So, now that I live alone and in a little apartment, arepas are few and far between. The frying oil permeates my apartment, and I dislike sitting eating what I consider family food by myself. The arepas we ate at the arepas bar were thick, and hollowed out to make room for fillings, but I make mine thin and crisp. 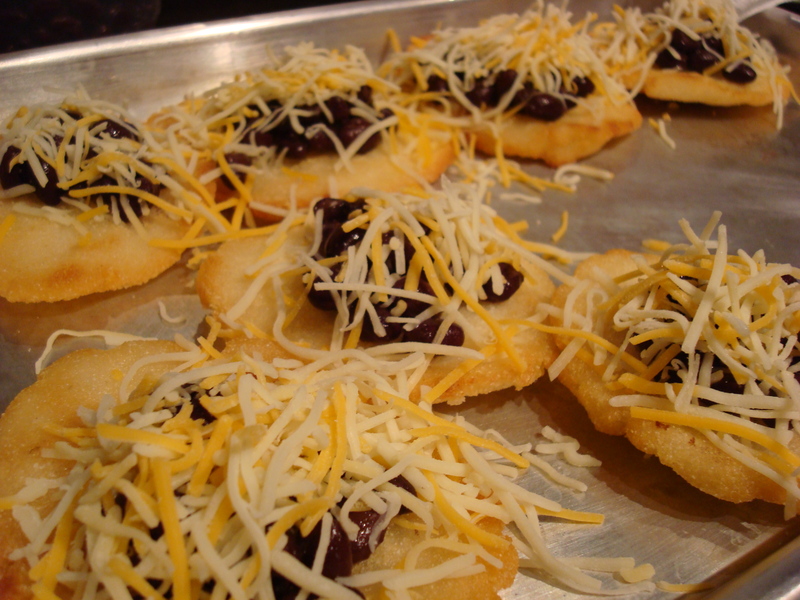 It eliminates the hollowing out step, and then I top the arepas with toppings like canapes. 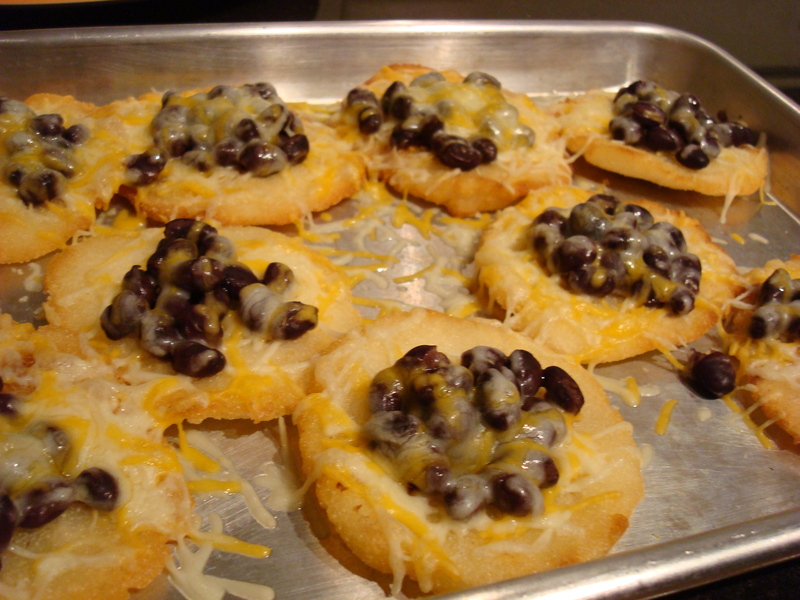 I think this would be an amazing appetizer for a dinner party, the crisp little arepas are just phenomenal with melted cheese and beans. I think any topping would be phenomenal. Maybe some pulled pork, or chicken to make them heartier. After the dough has rested a bit, wet your hands and form the dough into 2 tablespoon patties. Flatten them to about 1/4 inch thick. 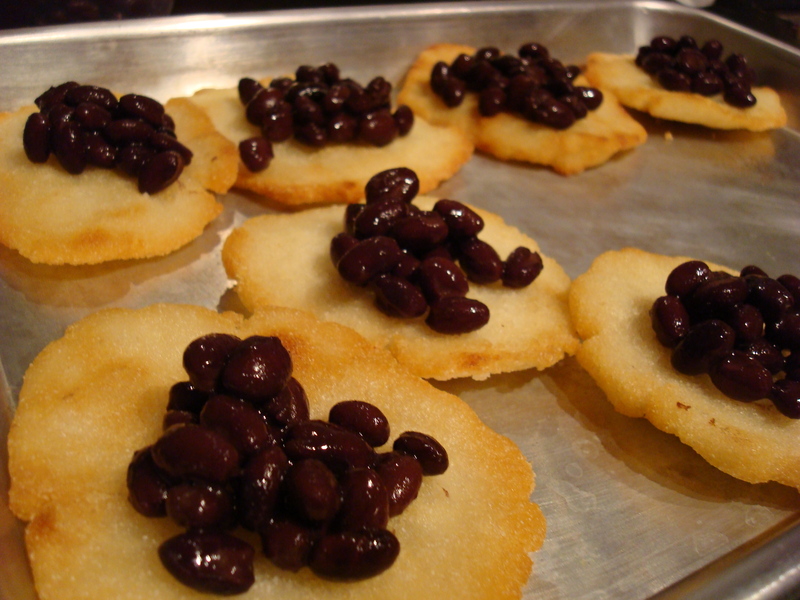 I used about 1 1/2 tablespoons per circle to make smaller and cuter arepas. 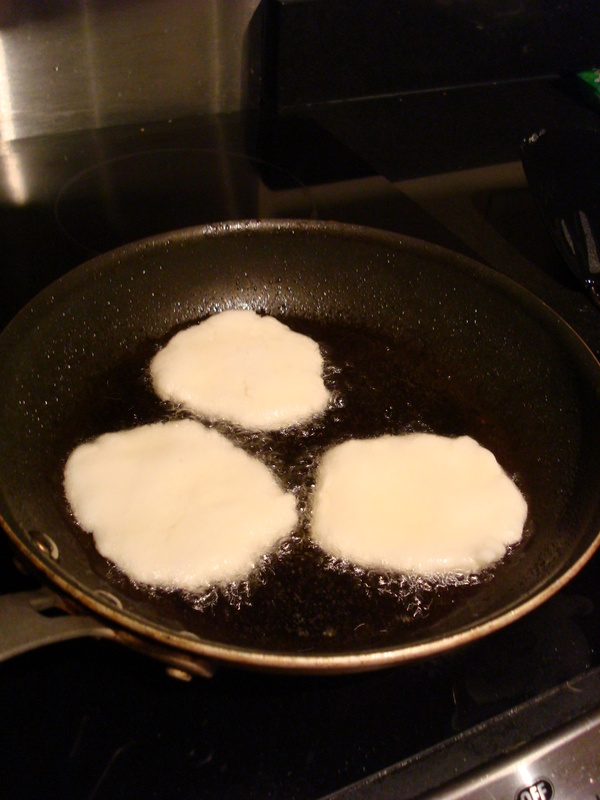 Fry the arepas in the oil until golden, about 4 minutes per side. 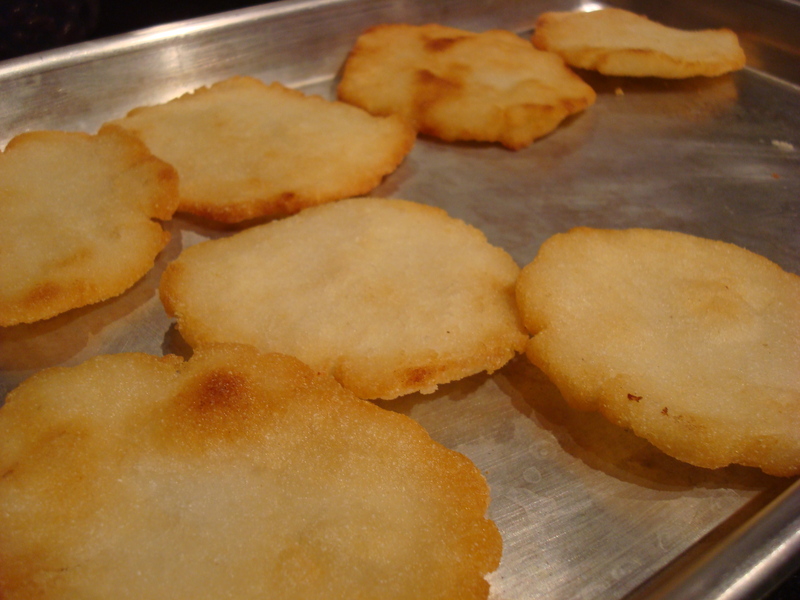 Allow the arepas to drain on paper towels, continue to fry the remaining arepas. 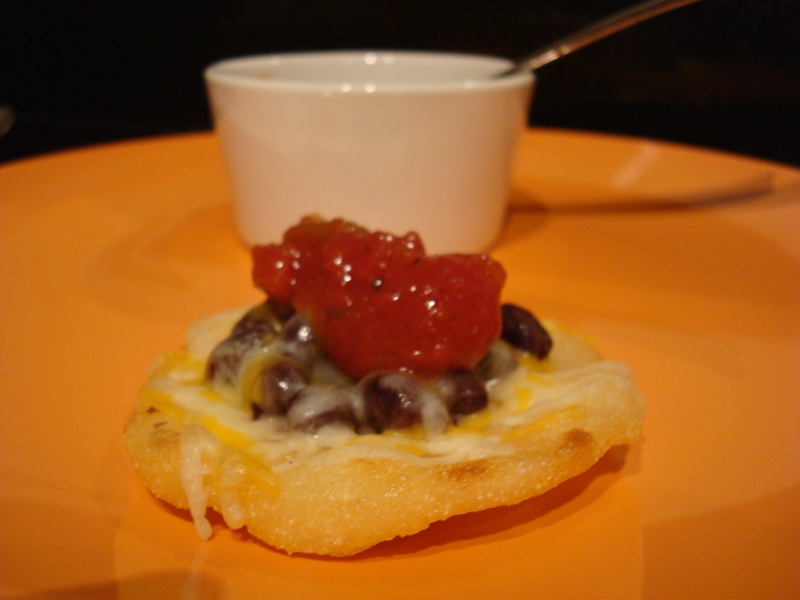 The arepas keep well in the refrigerator (without salsa) for up to 3 days. You can simply reheat in the oven for 10-15 minutes at 400 degrees. I was always a picky eater. Finicky too. Even if I liked something, if I wasn’t in the mood, I refused to eat it. My aunt tells me that the only thing she remembers me consistently consuming was orange juice. 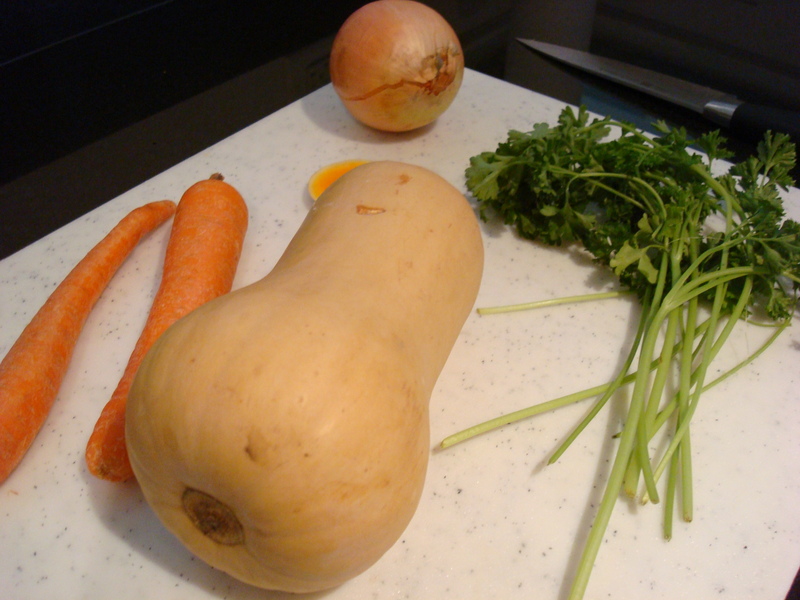 Anyway, despite my finicky eating, I did like vegetables. I like spinach and green beans, and I loved picking tomatoes out of the garden and eating them during the summer. I liked broccoli with cheese. I don’t remember if I liked mushrooms… but I love them now. I put them in my soup, on my pizza, and sometimes? I just eat them! A friend told me he dislikes mushrooms because the texture and squish they make in his mouth. Understandable! But, I wonder if I made him mushrooms if he would eat them. I steam them with some wine, and then with a little pat of butter I sear the mushrooms until they develop a delicious golden brown sear. They are a little crisp, chewy and juicy on the inside. Maybe it’s just because I inherently like mushrooms, but they are delicious! 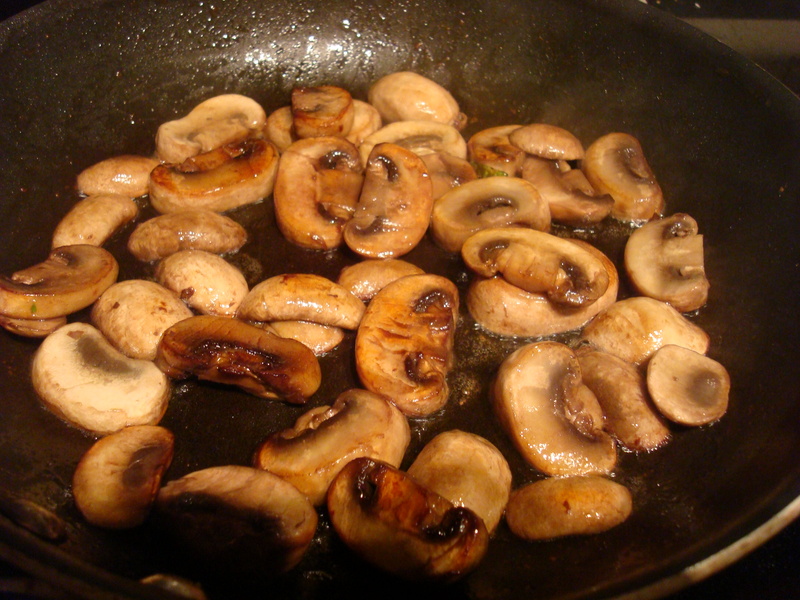 In a non-stick pan, add the mushrooms. 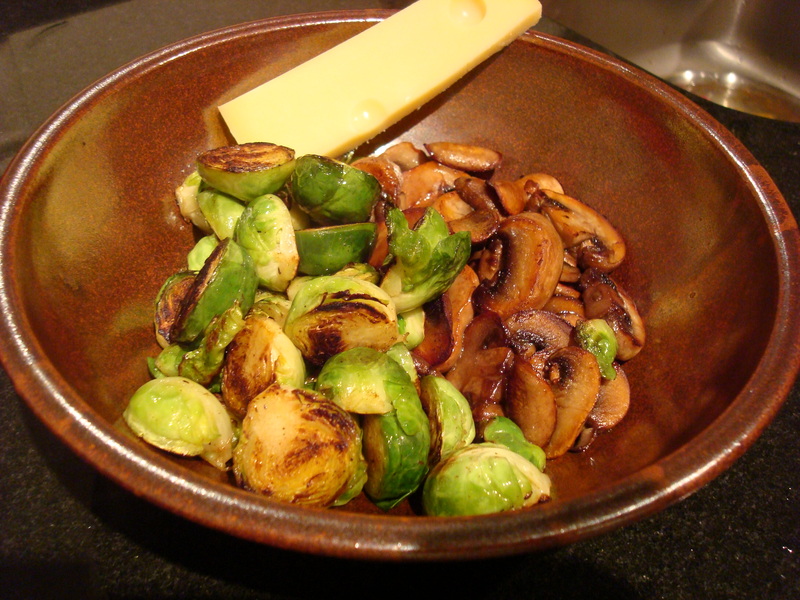 Sprinkle with salt to release the moisture in the mushrooms. Stir in the butter, and let the mushroom sear for 3 or 4 minutes per side. Serve hot! 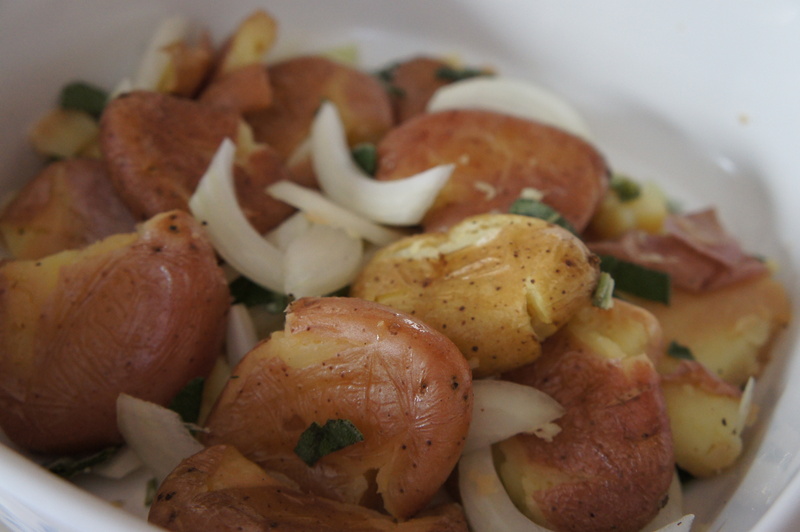 You can sprinkle chives or a little bit of pepper if you’d like. 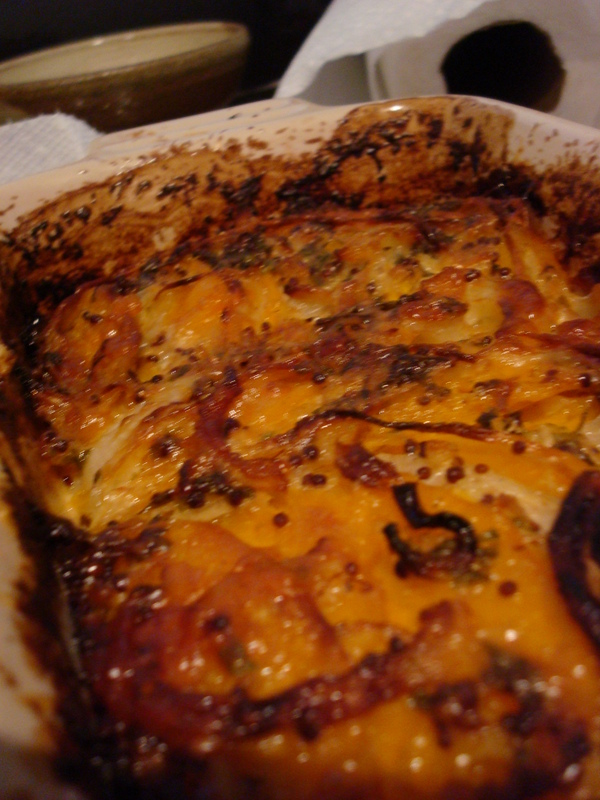 The first time I made gratin, it was a potato gratin. It was layered with gruyere, potatoes and heavy cream. Needless to say, as a measly 8th grader, I was horrified by the smell of the gruyere baking for 3 hours. The entire house smelled pungently of cheese, and I refused to taste the finished dish because to my unsophisticated nose the gratin smelled… ugh! My mother assured me that it was delicious, but I was certain my mom would think anything I made was delicious so I didn’t believe her. 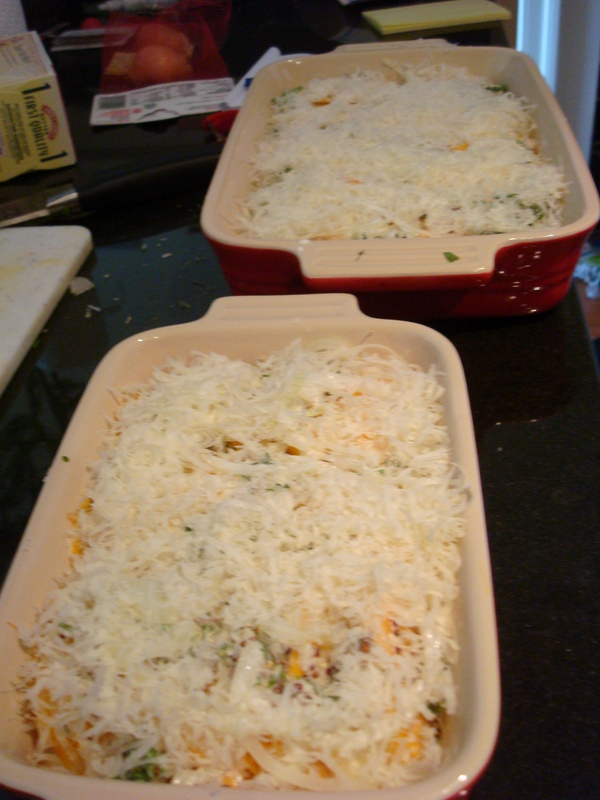 Since, I tried a variety of different gratins, using more or less cream and different types of cheese. I’ve grown to like the delicate layers of vegetables baked until meltingly tender and delicious with a golden crust of cheese. However, my rapidly increasing sized bottom multiplied by the long hours I spend in the library have lead me to believe that a decrease in cheese and cream is necessary. So I developed a lighter and slightly sweeter gratin that uses just enough cream to keep it together and just enough cheese to get a golden crust. Butter baking dish. I used two nested Le Creuset stoneware, one that is 4 by 9 and the other is probably 3 by6.